What is Infinity Control System? How do I control my bike? What are the riding modes? 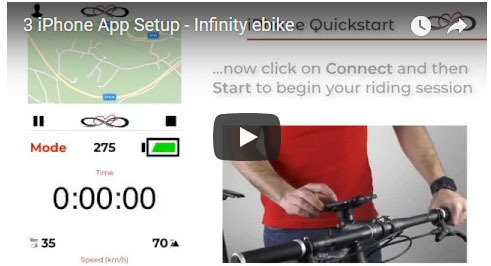 Why does Infinity ebike keep me FIT? Can I use the bike without smartphone? What is Infinity Ride Club? Which bikes are compatible with e-Race System? What is the weight of e-Race System? Why e-Race system adds 1.5kg only to the weight of my bike? What is the difference in 250W08 and 250W11 motors? How to increase battery range? How to clean and store the battery? Which kind of motor it is? Does the motor have internal brake resistance? What are the warnings for cleaning? From what do I start? Where are dealers in Europe? Is a test ride possible? Are the bikes available immediately? Where can I track the shipment? How to assemble the bike when it arrives? How do I clean my Infinity? How to take care of the bike?